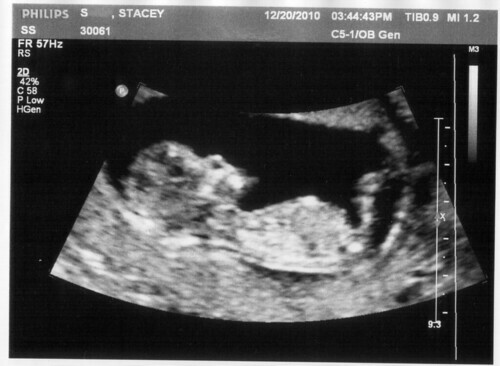 I headed into this ultrasound with my usual trepidation, although not as bad as it has been. Since my symptoms kept up after I stopped the meds, and my dreams still involved live babies, I felt a little more confident this time - although I don't think either of those are good methods of determining if the baby is still ok, but I'm still going with whatever makes me feel better and stop stressing. So the first second of the ultrasound is the scariest to me, and luckily the baby has cooperated the last couple of times to give me some instant relief by moving around. The first time I was surprised, since I had never actually seen a baby moving on ultrasound before. This time, I was more shocked - the first visual we saw of the baby (and this was the first time Ryan had seen it since it started moving), it was arching its back and flailing... and I instantly felt bad for it, because it reminded me of me trying to sleep lately. Hopefully the baby is flailing more because it's floating around and less because it can't get comfortable. So anyway, the ultrasound seemed to go well - we don't get the results of the NT scan back for about a week, once the bloodwork comes back too. But I think I saw a couple of measurements of the nuchal translucency fold at 2.5mm, which Dr. Google tells me is still within the normal range for how far along I am. We also saw the nasal bone (which I think I read that that isn't visible in 3 out of 4 babies with Down syndrome), so that should be a good sign - besides that we're in a fairly low risk group for Down syndrome and Trisomy 13/18 anyway, so hopefully the bloodwork comes back confirming that we're still low risk. Besides that, we got to watch the doctor categorize a bunch of body parts I'm pretty sure didn't exist a couple of weeks ago - bladder, stomach, heart (with all 4 chambers), etc. And we saw the fingers! 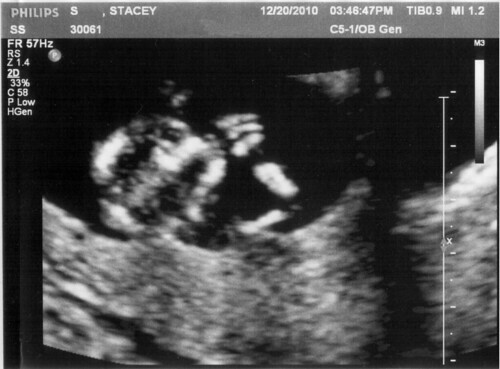 They were a bit ET-ish though, since they were mainly discernible on the ultrasound image by the glowing fingertips. The heartbeat was still good at 160 bpm, and the baby still looked like it was measuring a couple of days ahead. I'm not out of the first trimester yet, but this is about the most (cautiously) optimistic I've been so far. View from the top of the head, with little glowing fingers.